Moya – Calligrapher from Melbourne, Australia. Hi! Interview over at The Daily Stationer! Q: What would be your response to somebody who considers Calligraphy a lost art? Click here for the rest of the interview! You guys, I am so ready for this. I love teaching so much, and I love Brisbane, and I love the guys at Elemental Creative Hub – so I’m putting the three together on April 1st this year! If you are a total beginner or you haven’t done calligraphy for years but you want to get back into it, come in the morning – everything is provided, you don’t need anything, just turn up and you get a lovely goody bag to take home. And if you love it and want to stick around, or if you don’t need a beginner class but you want to spend some time refining your script, come in the afternoon and I’ll sort you out! If these book out (I sent out the announcement to my mailing list fifteen minutes ago and had my first booking ten minutes later! Guys, my FACE RIGHT NOW!) I might be able to put together another – but I’m only in Brisbane for a limited time so we’ll see how that goes. And if you want to join in: here’s the link to book! 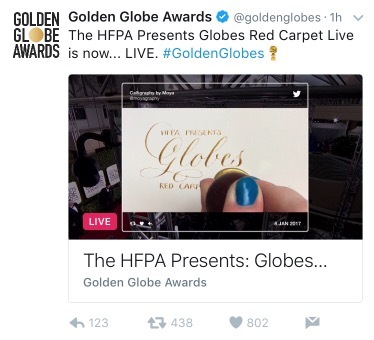 “As featured at the Golden Globes” … no, for real, though. 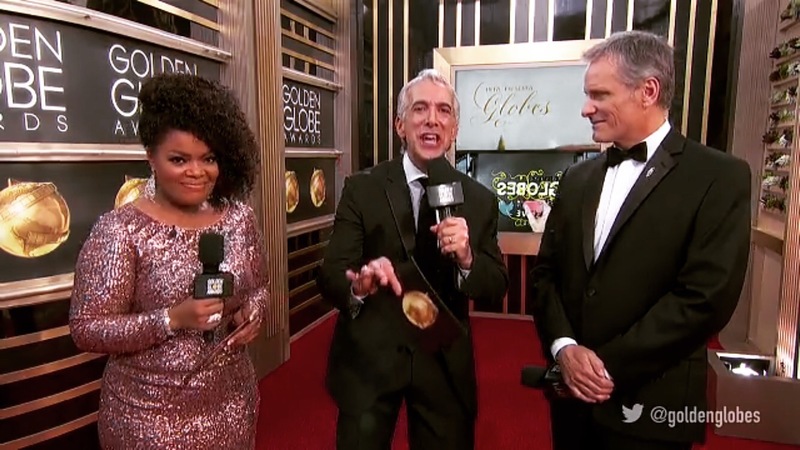 Needless to say I watched the entire red carpet show, which started early on a Monday morning here in Australia. I was supposed to be working at the time, but I was far too busy squeaking with glee every time I spotted myself. ‘scuse me I’m just going to be bouncing up and down in my seat in excitement for, oh, at least a few more days. Shoutout to Karl at KustomHaus wax stamps – I needed a custom seal for this video in a big hurry, and he was fantastic to work with. If you’re in Australia and you need a wax seal or ten, highly recommend! Earlier in the year I was contacted by a letterpress studio I do quite a bit of wedding work for – Bespoke Letterpress in New South Wales. This time they were in need of a tiny bit of lettering for their 2016 Mother’s Day Card. I was more than happy to help! The process of creating lettering for letterpress is, I have come to learn, not quite the same as regular calligraphy. The output is never quite the same as what comes out of the pen – a letterpress plate interacts with the paper very differently to a nib. Little gaps in lettering, like an ear on a ‘g’ that’s not quite touching the bowl, can come out of a letterpress looking like the plate is damaged or the ink has skipped just slightly. A stroke that leaves my nib as a fine hairline may need to be thickened in order to show up at all. So on top of the usual draft-contemplate-redraft-consider-rework process, there’s always a need to keep in mind what the design is for, and how it will get there. I was seriously so delighted to see the final versions of these cards. Rose gold foil and the most beautifully delicate border! And of course, the best thing about social media and the modern world is that, 750km away, I still get to see a snippet of them being printed. How cool is that? How to: Calligraphy on macarons! The jobs that come out of the blue are always the most creative and inspirational. I was contacted by a really beautiful bride, about a week before her wedding, asking me if I could write guests’ names in calligraphy on salted caramel macarons. Wow! I had never done such a thing before, and had no idea if it was even possible … so I immediately emailed the best bakers I know (Kadri of cakeophilia – check out her blog for some seriously impressive baking – and Suzanne of no-blog-but-who-really-should-make-one) – to ask a few important questions. Like: is there such thing as edible ink? Does it come in gold? And, even more importantly, with five days to go, where do I get it in Melbourne? The answers were yes, yes, and West’s Cake Decoration in Burwood. We trialed a few things and found that the pens they sell are useless for this purpose, but they have tubs of edible paint that’s only a little too thick to use a brush with – and that dilutes nicely with just a touch of water. don’t be afraid to mix edible inks! I was, at first, but the combination of deep brown and gold ended up looking fantastic, where just deep brown would have been too stark and just gold would barely have shown at all. don’t work in the studio! I ended up doing these on my kitchen table. There’s just too much in the studio – I was working on a piece at the time that I was using lapis lazuli pigment to decorate, and trust me, you do not want that stuff in your food. But even if I wasn’t using mildly toxic pigments, I didn’t want to risk exposing food to anything I wouldn’t eat at all. The kitchen table was a much safer bet. EAT FIRST. I wore a face mask and a headscarf to keep my hair out of the way and my breath off the food (because ew) – but I still spent hours bent over delicious, delicious salted caramel macarons … I didn’t want to eat the mistakes, either, because it was the day before the wedding – you know who’s a lot more in need of a sugar hit than a calligrapher? A bridal party, that is who! – so my tummy definitely made some noises. keep the macarons in the fridge as much as possible! I ended up just taking out one box at a time, working as quickly as I could, and putting the box straight back in. The filling will melt at room temperature and make the top half slide around – and that ends badly for calligraphy. don’t touch them! just don’t. macarons are so light and delicate that I did not want to risk one single crushing, or slip, or even fingerprint. I wore food-grade silicone gloves and the only thing that touched the macarons was the paintbrush – which I bought new for the job, and washed in dishwashing detergent first (and rinsed thoroughly) just to make sure. HAVE FUN. I love doing things as unusual as this – and the lovely bride was so thrilled with the result. Working with someone who’s as excited as you are about what you’re creating is such a joy. This one has to go down as one of my favourite jobs for 2016 – I know it’s a little early to make that call, but I’m making it anyway! I’m addicted to Periscope lately. It’s an amazingly good teaching tool for calligraphers – so much of our craft is really difficult to convey without hearing and seeing someone do it, and seeing it close up; Periscope lets that happen and even gives you the opportunity to interact. I’ve stayed up far too late a few times listening to Paul Antonio (@pascribe) discuss flourishes or Kei Haniya (@keihaniya) talk about drills! And of course, seeing all that teaching and learning going on makes me want to join in – so I did one a while ago (now safely lost to the internet) on how useful I find the Ames Lettering Guide. I can’t seem to make Instagram embeds work here (I’m sure I could figure it out, if I put some time into it, but I’ve got better things to do!) but here is a link to a 15-second clip of how the guide works that I posted on Instagram the other day. I’ve had a few questions about it since then, so I thought I’d put together a few links. You can use this tool on anything as long as you have a t-square and a pencil – or even just a ruler and a pencil, but it’s really the t-square that makes the magic. I’ve done a few large-scale wedding seating charts lately, and this is the device I used to rule up all of them – there’s no other way I could so quickly and accurately get lines exactly 6.5mm apart all the way down a one-metre-high piece of card. The Ames Guide was originally, I believe, designed for engineers, architects, and comic book letterers. All three of those professions now letter digitally for the most part – it’s just us calligraphers now. The guide itself seems to go for something ridiculous on eBay … but you can get it for $3.30USD at Paper Ink Arts. If you don’t have a t-square, you can just use a ruler, but you’ll have more difficulty lining up the guide if you don’t have an easy way of ensuring your ruler is perfectly horizontal. You’ll also need an edge to rest the t-square against. With these seating charts, I used the table – I taped the chart down with artists’ tape against the corner of my kitchen table, so that I could be sure I had a perfectly square edge to work from. With anything smaller, I would have used my slope drawing board. Occasionally, if I am working flat, I just use the edge of my lightpad, which is conveniently squared and has ruled markings. Here is a clearly diagrammed article discussing its use in comics. Not so useful for calligraphers, but it is the clearest explanation of the ratios I have found. This one focuses on broad pen scripts, and is very thorough. And here is a quick youtube video (produced by someone else, not me) covering the Ames Guide, so you can see it in motion. I hope those are useful! If you want to follow me on Periscope, I can’t promise any particular wisdom, just the occasional babble … but you can find me under @moyagraphy. As a working calligrapher in 2016 I get to do all sorts of things. Most of my work I do from home, in the peace and comfort of my studio; most jobs mean long hours alone. I like it that way, of course – most calligraphers do, I think! None of us would do this job if we didn’t. Which makes it all the more fun and interesting to be asked to attend an event as a calligrapher. It’s a real joy to work with and in front of people, and to get a chance to talk with people about what my job is and how my pen works and how I learned to do it. I’ve heard these events described as “event calligraphy,” “on-the-spot calligraphy,” “in-store calligraphy” – I don’t know if there’s a name for it. I generally go with “event calligraphy” for ease of reference. And I have a few tips for managing these events, most learned from experience. If you’re planning to hire a calligrapher for your guests, here’s what you need to know. I often get questions about how large or how high the table has to be, and my usual answer is: if you would find it comfortable to sit and write at it for two (or four, or five, or eight) hours, then I probably will, too. I once arrived to find a stool the same height as the table, so there was a small delay while we found another chair that was low enough for me to work. I’m lucky enough not to have any physical movement problems personally, but some calligraphers do, of course. And we all need to be able to reach the table! Calligraphers need room for arm movement – or at least, I do, and I imagine anyone writing in the same style as me does. So the table doesn’t need to be so very large, but it does need to have enough space for a few bottles of ink, some pens, and the paper that I’m writing on, and there needs to be room to move my right arm and shoulder without hitting anything behind it. That’s about it. If you can get your calligrapher a sample ahead of time, she’ll love you! Not all ink reacts the same way to all paper, and having a sample to test inks on can save a little messing about on the day. If you can’t – don’t worry. I always bring along several types of ink and a few calligraphy ‘trade secrets’ (I’m talking about gum sandarac, of course) so that I maximise the chance of finding the right combination. In general, very absorbent papers and very glossy papers are difficult; most high-quality cards and tags are fine. People love watching calligraphy. (Which is fair enough, since calligraphers love doing it.) The most successful events I have been to were the ones in which a member of staff kept a watchful eye on the queue, standing by the calligraphy table and managing expectations. Calligraphy is a slow process! I can speed it up for demonstration purposes, but if there are a lot of people in line, it can be a long and frustrating wait. It’s great to have a staff member on hand to keep track of who’s waiting, to enforce a certain number of tags (or cards, or chocolates, or items) per person, and to make sure everyone leaves happy. Even for those of us who do it every single day, nonstop handwriting is tiring! If your event goes for more than two or three hours, try to arrange a time for your calligrapher to take five or ten minutes off halfway through. It’s good if your queue manager can be aware of this so they can let clients know. If you think it’ll be too busy and you’ll have too many customers for a calligrapher to manage … hire two! It’s a small calligraphic world, particularly in Australia, and we pretty much all know each other – chances are good that any one of us can connect you with several more. And the more calligraphy the better, as far as any of us are concerned. What are your thoughts on event calligraphy? What would you like to know? Comments are always welcome. Where to learn calligraphy in Melbourne? I am emailed this question a lot, because there are so, so many people out there who want to learn – which absolutely delights me. There’s a lot of hand-wringing about calligraphy being a “dying art” but in my experience, it’s flourishing. Melbourne is actually a wonderful place to learn calligraphy. There are some amazing teachers here with decades of experience in teaching hand-lettering and calligraphy. I’ve been very lucky in that I’ve had opportunities to study with not only the best teachers in Melbourne and in Australia, but also some of the best teachers in the world, who have travelled to Australia to teach with my group – the Calligraphy Society of Victoria. The CSV has been active since 13 August 1981, and for all of that time has been offering workshops and continuing education, which speaks volumes to the care and effort put in by the committee. Workshops are open to everyone (but are slightly cheaper if you are a member) and are taught by very experienced and very talented teachers – I’ve never taken a workshop that didn’t leave me thrilled and inspired. The other Melbourne calligraphy event that you should know about is the Summer School in Winter that the CSV hosts. Every year, international and local teachers spend a week in Melbourne running five days of classes (split into three-day and two-day workshops) – accommodation is available for interstate or overseas travellers if you book quickly, and the instruction is unbeatable. It was at SSiW that I had the chance to learn from international teachers like Luca Barcellona, Jake Weidmann, Elmo van Slingerland … an absolute privilege every time. Spots in these classes fill up very quickly, so you need to be quick off the mark in booking, but it’s worth it. The teachers for 2016 are Olive Bull, Susan Hufton from the United Kingdom, John Mathieson from South Australia, Brody Neuenschwander from Belgium, and Amity Parks from the USA… the only bad thing about that list is that you can’t take everyone’s class at once. I know what I’d do if I had a Time-Turner! Painted borders in class in 2013, with teacher Lynne Muir. I can’t overstate the value of taking a class with a skilled teacher. I learn something new every single time, even about things I thought I already knew, even in classes I didn’t think I needed to take. A version of this post first appeared on my other blog, over at Calligraphy By Moya – I’ve come to the conclusion that it’s a little ridiculous to run two blogs, and am combining them into one. Recently (well, July 2015, so not very long ago) I was asked to teach a class on copperplate calligraphy at Veronica Grow’s Old School New School in Abbotsford. I agreed to come in and teach, and I was so glad I did. We had a fantastic time. Old School New School is set up in a gorgeous loft space in the Abbotsford Convent, and the walls are plastered with Veronica’s students’ work. There’s a huge skylight letting in sunshine and happiness all day long. I wish I had a studio space like that to work in every day! OSNS is a modern design and typography school, whereas I think of myself more as a traditional calligrapher; the two disciplines are different but very much complementary. The students had all done some basic copperplate with Veronica, and my job was to help them refine their control over the pen and learn some majuscule forms. We spent quite a bit of time on proportion and on developing a light touch – I am sure I made myself unpopular by demanding they all learn with a much finer and more flexible nib than they had previously been using, in order to develop a surer hand, just as my teachers made me once upon a time. I also insisted on oblique penholders. I think both those ideas paid off and I’ll definitely be doing that again if I ever teach another class. It was absolutely joyful being able to help others learn this art that I love so much. I loved the experience of teaching, and of seeing students reach those “a-HA!” moments that I get so often myself. Calligraphy is really a lifelong journey and it was pretty special to see others setting foot on the path. 1500km. Six days of calligraphy. Heaven. Happy New Year, everyone! My holidays have drawn to a close and I’m very ready to jump back into everyday life feet-first. This year’s going to be a good one – I’m sure of it. The more that I learn about calligraphy, the more that I see how much I have to learn. It really is the craft that never stops giving – there’s always more to learn, further to go. In comparison to where I want to be, I sometimes feel like a toddler fingerpainting on the walls. So I spend all my free time learning and studying and thinking about lettering to the point of just being a little bit too obsessed … but I’m happy. I was lucky enough to spend the past week studying the Italian hand of Bennardino Cataneo with Gemma Black at the Sturt Summer School in NSW. I could have flown up there and saved myself the drive, but I really wanted to be able to carry all my gear, so I hopped in the car around 4am on a chilly Sunday morning and hit the highway. I sort of love long drives, or long train rides, or long bus rides; there’s something very peaceful about being on the road. And I learned so many things over the week! A lot about Bennardino Cataneo, and the 1545 manuscript we were studying; a lot about handling a pen and making decisions about where to place words on a page; even some rudimentary bookbinding. I had a fantastic time – it was fully catered and the accommodation was on campus, so it really was just a week of rolling out of bed, being given all your meals, and doing nothing but art every day. I wish it could have gone on for ever. One thing that I am learning over and over again as I study: an hour with a good teacher is worth about a week of studying at home. Although the studying at home helps! I feel like I also made some strides in understanding how to analyse a script this week, and now I need to attack my books all over again and look at all the manuscripts I can find and learn them all … it never stops. And I never want it to. To look at my work or ask for a quote or a commission, please pop over to Calligraphy by Moya. See you there!